"Some day well be movie stars, too! The DS9 crew dies laughing at that, so B5 wins.note Image courtesy of Wizard Magazine (archived here ). "There's some splendor, but a whole lot of warfare in the grass, in A Bug's Life, the latest computer-generated insect film of the year. Did I ever think I'd ever say that sentence? And who ever thought we'd get two in one year?" This page is a list of similar works made during the same period of time. Sometimes one work intentionally copied another. Sometimes it's part of a wider trend in which that type of work became very popular all of sudden and others are made. Sometimes it's total coincidence: the creators just had the same idea. Which is the original and which is the imitation is not always completely clear; sometimes, however, it is painfully so. Sometimes, rather than home-brew a knock off, a company will license a foreign work, and adapt it to be more like its competitor. Occasionally, creators will be forced to war with one another when they simultaneously produce similar works which are subsequently released within a short time from each other. One thing to remember regarding Dueling Works is that Tropes Are Not Bad — while many Dueling Works appear to be blatant rip-offs, the competition between two shows (or simply the desire to set each other apart) often spurs each other to develop in quality. The result is a grateful television audience. See also Dueling Products for proof that this type of competition isn't limited to just works. See also The Mockbuster. Not to be confused with Dueling-Stars Movie. Again, just to be clear: The works have to be produced during the same time period, otherwise you've got either Follow the Leader or Serial Numbers Filed Off. Also see Fandom Rivalry. One happening within Marvel's own works between All-New Wolverine and the 2015 Old Man Logan over which is the "rightful successor" to previous Logan-led Wolverine books. Points in All-New Wolverine's favor is the title, and the fact that Laura is actively using the Wolverine name and is marketed as Wolverine by Marvel. However a segment of the fanbase considers Old Man Logan the "real" Wolverine book since it stars a Logan, while citing its much more violent content. DC's Doom Patrol and Marvel's X-Men. Both teams consisted of super-powered individuals shunned by the world, were led by a man in a wheelchair, and premiered within months of each other in 1963. 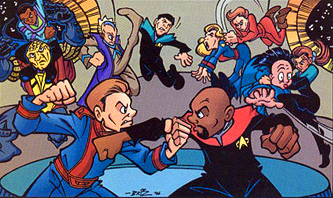 DC's Who's Who and Marvel's Official Handbook of the Marvel Universe have competed with each other a number of times. During the original run of Who's Who in the mid-1980s, Marvel released the second volume of OHOTMU (also known as the Deluxe Edition). After releasing updates for Who's Who in 1987 and 1988, OHOTMU received an update in 1989 (that same year, DC included Who's Who entries in a number of their annuals). When DC revamped Who's Who in 1990 as a customizable loose-leaf edition, OHOTMU followed suit with their loose-leaf Master Edition before the end of the year. DC's Swamp Thing and Marvel's Man-Thing premiered around the same time in 1971, by writers who were roommates at the time. When Swamp Thing received his own series in 1972, his origin was changed and became much more similar to Man-Thing's, who also received an ongoing feature in Adventure into Fear at the same time. DC's Superman and Fawcett's Captain Marvel, so much so that when Captain Marvel's books sold better than Superman's, DC sued Fawcett over similarities between the characters. DC would eventually buy the rights to Captain Marvel from Fawcett. Ironically, these days Superman and Marvel have Friendly Fandoms due to their similarities. This was succeeded by DC's (formerly Fawcett's) Captain Marvel and Marvel's Captain Marvel, as the latter laid claim to the name after Fawcett ended its run but before DC picked up the original character. DC's resultant inability to name its comic after its lead character ultimately led to a trope. DC's Archives and Marvel's Masterworks series of hardcovers for reprinting classic runs. DC's Justice League of America and Marvel's The Avengers, both teams consisting of the biggest superheroes from each company. Champions (2016) and Teen Titans (Rebirth) have been launched around the same time and are flagship teen superhero team books of Marvel and DC's respective waves of comics of 2016, both feature very diverse cast and both are a subject of a Broken Base mostly breaking on each respective writers interpretation of the characters. They also both initially featured Animesque art styles. Main differences are that Champions feature mostly characters who hold their own books at the same time, while Teen Titans doesn't and that Champions tries to tackle serious social issues while Teen Titans focuses more on battles against supervillains. Disney's Frozen franchise and Dreamworks' Trolls franchise could be considered this. Both franchises are major cash cow franchises aimed at girls that are set in fantasy worlds and have a major focus on music. They both also have Christmas specials that were released the same exact weekend, and have upcoming sequels slated to be released in the same 3-month timeframe. In terms of DVD sales, Frozen is the more popular film, but Trolls has moved more merchandise than Frozen ever since it was released to theaters, to the point where it was the second-biggest licensed property the year it came out , only beaten by Star Wars. In 2016, two different toy companies came out with toys based on the "unboxing" craze: Hatchimals, which were made by Canadian company Spin Master, and L.O.L. Surprise! by MGA. Though the first had a very strong start with being 2016's most popular toy and some pieces of branded merchandise, L.O.L. Surprise!, on the other hand, beat out Barbie as the top-selling doll brand by 2017 and has had sold more products since than Hatchimals ever since. On March 19, 2018, there were two children's books written about [the pet rabbit of Vice President Mike Pence's family, Marlon Bundo, written from different sides of the political spectrum. The official version was written and illustrated by two of his daughters and was little more than a fluff promotional piece for them. Meanwhile, the other version was created by the team behind Last Week Tonight with John Oliver satirizing his more controversial views while still being for children and containing An Aesop about acceptance and the power of democracy, as well as all of the proceeds going to gay charities. While they both entered the bestseller's list on Amazon, John Oliver's won out by selling more copies (even reaching the #1 spot) and gaining way more positive reviews. Survivors, Dogs of the Drowned City, and The Last Dogs are three similar series that came out around the same time. They're children's xenofiction literature about a group of dogs surviving on their own in a city after their humans evacuate due to a natural disaster (an earthquake and a hurricane respectively in the first two) or a disease sweeping throughout the country (in The Last Dogs). Dogs of the Drowned City was a trilogy, The Last Dogs was a tetralogy, and Survivors has twelve books and three novellas. The 2010s have the Peter Diamond series by Ben Aaronovitch and the Shadow Police series by Paul Cornell, which are both stories about Metropolitan Police "magical crime" squads written by former Doctor Who writers. Halestorm and The Pretty Reckless, both being 2010s Hard Rock bands with female lead vocalists, get compared a lot, e.g. this video. The two groups toured together for a month in 2015 and from the sound of it their respective frontwomen Lzzy Hale and Taylor Momsen actually get along pretty well. Whenever an artist releases multiple albums on the same day, there can be a competition to see which one will sell the most copies (examples: Guns N' Roses' Use Your Illusion I and II, Bruce Springsteen's Human Touch and Lucky Town, and the solo albums of all four KISS members). The classic example for this trope in music would be The Beatles and The Rolling Stones. An Older Than Steam problematic : in the 17th century Paris, the two only permanent theatres (Théâtre de l'Hotel de Bourgogne and Théâtre du Marais) would compete via "dueling pieces", sharing the same themes (and often adapted from the same foreign plays) and tailored for the "stars" of the respective troupes. Probably not intended as such by their respective creators, but Chicago and A Chorus Line can be seen as this; as Ben Brantley (chief theater critic for the New York Times) argued in his review of the 1996 revival of Chicago: both are Broadway musicals that opened in 1975 and center on aspiring stage performers, but while "A Chorus Line was built on the premise that if you scratch the surface of an entertainer, you'll find a trembling, vulnerable child; Chicago scratched that same surface to uncover a manipulative egomaniac.  " Additionally, while the original production of A Chorus Line held the record for longest-running Broadway musical for many years, the revival of Chicago has since surpassed it, and is now second only to Phantom of the Opera. The SpongeBob Musical and Escape From Margaritaville could be considered this, as both are tropical-themed musicals based on well-know pop culture icons that deal with the main characters facing a disaster and trying to stop it. While SpongeBob has received glowing praise, the reviews for Margaritaville have been negative. To make matters worse, there had been reports of the audience at the latter show acting very rude (doing thing like acting drunk and singing along to the songs). However, neither of them were big successes at the box office, with both shows closing the same year. However, the soundtrack for the former became a Billboard Kids' Audio hit, even after the show closed. Disney Junior Dance Party and Nick Jr.'s Move To The Music are two dance party-themed touring shows based on popular preschool blocks that are touring around the same time (however, the Disney show has seniority over the Nick once, premiering a year and a half before). While the first version of the Disney show was poorly recieved because most of the characters were just screen projections and not costumes and because most of the time was spent with the DJ hosts, the second version was seen as better in the eyes of most fans. As the Nick Jr. show has yet to open, it's unknown how well it will do. In 1935, the first themed attraction in the United States, Santa's Candy Castle, was opened up in Santa Claus Indiana to capitalize on all the attention the town was getting for it's name. Across the street from the Candy Castle, a rival Santa Claus themed attraction called Toy Town was also created. The conflict over the similar attractions and disputes over the land on the park led to years of lawsuits, which went all the way up to the Indiana Supreme Court. In 1946, a third competitor opened up Santa Claus Land in the town, which was later rebranded as Holiday World.